Butler, Party of 4: Health Quotes from Doctors & WHY Eat Salad! There is an article in this month's Self Magazine that has and interview with the doctors from the show The Doctors. Here's another tip from Men's Health Magazine explaining WHY we should eat our greens!! According to researchers at Penn State University, if you add a salad to your entree, you'll consumer 11% fewer calories than when your meals don't include green. 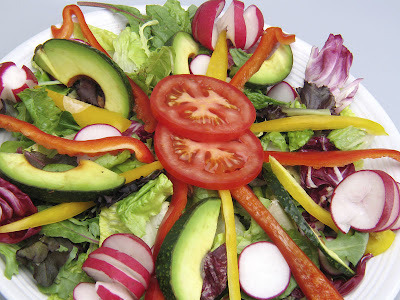 Eating a salad increases satiety levels without packing on calories. Hope you've had an awesome weekend!! I'm a big salad eater. My downfall is ranch dressing :( whoops. I don't drench it in it, but I get tired of always having to choose Italian or something lighter of the sort.. Thanks Danielle! As you know I'm getting into shape! Treating my body right, eating good, and exercising on a daily basis! I have been feeling so much better lately! Thanks for this!